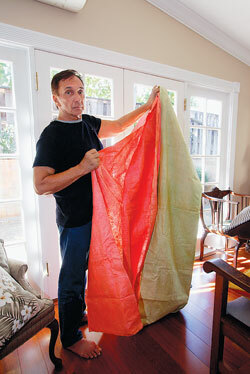 Kaha'i Topolinski made the feather cape, above, for his son Micah's wedding. Center, the back of the cape shows how the feathers are attached. Feather cloaks of old Hawaii were worn as a symbol of rank and status. 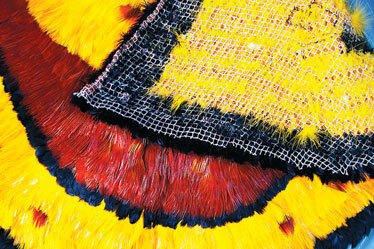 Red and yellow feathers were especially treasured but often difficult to acquire. Bird catchers would spend endless hours in forested areas seeking the 'o'o, mamo, 'i'iwi and 'apapane. Only a few feathers were plucked from many birds. Modern feather workers don't need to manually collect feathers, but the intricacy of the art form is labor-intensive nonetheless. The feathers, generally taken from more common birds and colored, are purchased from mainland distributors but still need to be clipped, tied and bundled. Once bundles are made, they are individually tied to specialized netting. "Men wore these as a mark of nobility, a mark of chiefly rank," explained Kaha'i Topolinski. Women of rank were allowed to wear feather leis. Topolinski made a feather cape for his son Micah to wear in his wedding last weekend, working for a year on a design that reflects the ancestral heritage of his wife's family. "Our son's ancestors are from the line of chiefess Kehu'iapo'iwa, the mother of Kamehameha the Great," he said. Topolinski holds tapa that was draped around the bride and groom. That ancestral line, going back to the chief Kualii, is represented in the cape by the color yellow, which also signified sunrise. The black in the cape represents the land of the Oahu alii. The red crescent represents Chief Kualii resting in a hammock, as he lived 175 years, according to ancient historians, and had to be carried to visit his subjects. The thin black crescent under the red represents the hammock. Lastly, red specks in the yellow represent the ground bones of Kualii that were mixed into the poi of his loyal chiefs. Kualii ordered this action so that he might live on forever in his chiefs by passing his mana, Topolinski explained. "We chose to do this for our grandchildren and our kids," he said of making the cape. "In spite of what's happened, Hawaiians still have a hold on their personal family heritage. In this day and age, it's good to have roots. Hawaiians believe that you need to know where you are from, where you are going." Topolinski continues to pass down the teachings of feather work in weekly classes at Na Mea. "In spite of having busy lives, these things need to matter as much now as they did 100 years ago." He teaches traditional foundations of the art first, rather than relying on timesaving tools such as glue. Students need to learn about color choices and how to properly attach the feathers, he said. And, a "good frame of mind" is a necessity. "If we don't share these types of things, they are going to die."